Situated in the Western Ghats of Karnataka, Mangalore is one of the important centers of exporting coffee and cashew nut. It is a hilly city with winding disoriented streets located some 357 km away from the city Bangalore. 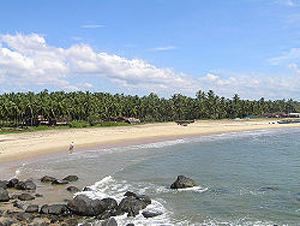 Mangalore district is a panorama of palm-fringed beaches,lush green fields and enchanting forests. 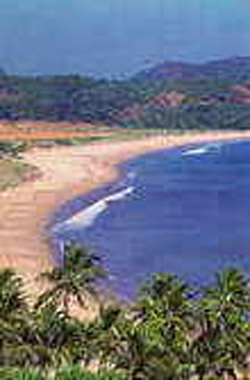 It is sheltered by the soaring western ghats on the east and the mighty Arabian sea roaring along its western shores.With an important port,this coastal town is a major commercial centre.The lifeline of the district, the National Highway No 17 almost runs parallel to the sea for over 95 kms in the district. Nowhere does the distance between the highway and the sea exceed more than a few kilometers. Mangalore,the district headquarters, has a long history of maritime trade. Though developed as a business and commercial centres Mangalore still retains its old world charm-old tile-roofed buildings amidst coconut groves, fishing boats silhouetted against the darkening skyline, fishermen hauling in rich catch of fish,sea food served in spicy coconut curries. Mangalore is a remainder of the good times of life. The district offers a wide range of interesting places for both pilgrimage and pleasure tourists such as Dharmasthala, Subramanya, Kollur, Udupi, Karkala, Venoor and Moodabidri. Address:Situated in the Western Ghats of Karnataka,357 km away from the city Bangalore. Best time to visit: September to February. Being in the tropical region of the country, it has a languid tropical atmosphere, hot and humid during summer and comfortably cold during winter season. Winter is the best time to visit this place as the humidity during summer makes traveling uncomfortable. Mangalore has a tropical climate; summer and winter months experience similar temperate conditions, with average temperatures ranging from 27 °C (81 °F) to 34 °C (93 °F). Humidity is approximately 78% on average, and peaks during May, June and July. The maximum average humidity is 93% in July and average minimum humidity is 56% in January. Under the Koppen climate classification, Manglore belongs to the Tropical/megathermal zone and is under the direct influence of the Arabian Sea branch of the South-West monsoon. It receives about 90% of its total annual rainfall within a period of about six months from May to October, while remaining extremely dry from December to March. The annual precipitation in Mangalore is 4,242.5 millimetres (167 in). This city is said to have been named after the famous Mangaladevi Temple. This temple, also a tourist spot, is situated 3 km away from main city area. This temple was built by the Ballal family of Attavar in memory of a princess of Kerala. Not much history could be found about this area though the local museum would be a right place to go for the history of this place. 1. There are a lot of temples and churches to visit, or if that doesn't interest you, relaxing at the beach is a good idea. 2. For the adventurous, the western ghats near Mangalore provide an ideal location to get lost in the dense jungles. 3. Pilikula nisarga dhama is about 12 km from city and is a tourist spot with "manasa" water theme park, animal park, boating, science centre, arboretum,golf course etc., all in one place. Sultan Battery is situated in Boloor 4 km away from Mangalore City. It was built in Black stones by Tipu Sultan to prevent warships to enter Gurupur river. 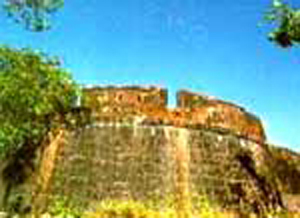 Now the remaining part of the fort is called as Tipu's Well. It is today a deserted spot but its construction is bafflingly exquisite. Although it is a watchtower, it gives the impression of a miniature fortress with its arrangements for mounting cannons all round. 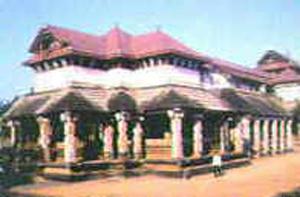 Tour to Mangalore Kadri is another ancient historic spot in Mangalore. The Kadri Temple dating back to about 1068 A.D. with its nine tanks, its square temple, nestling at the foot of the highest hill, draws to Mangalore hundreds of visitors annually. The Lokeshwara bronze statue of the Kadri Manjunatha Temple is tipped to be the best bronze statue in India. On top of the hill King Kundavarma Bhupendra built a mutt, which came to be called 'Jogimutt'. There are some stone caves on top of the hill, which are known as the caves of the Pandavas. St. Aloysius Church is situated 1 km away from the city's main center. The walls of the church are covered with the paintings of the artist Antony Moshaini of Italy. The church was built in the year 1899-1900. St. Aloysius College Chapel, an architectural gem, comparable with the Sistine chapel in Rome, is situated on lighthouse hill. The special beauty of the chapel is the wonderful series of paintings that virtually cover every inch of the interior roof and walls. Shri Sharavu Mahaganapathi Temple of Mangalore is known as a pilgrim center and boasts of many sacred temples like Sharavu, Kadri, Mangaladevi, and Kudroli etc. Out of these Sri Sharavu Sharabeshwara - Sri Mahaganapathi Kshetra is an outstanding, pious center of great illustrious history of marathon 800 years. Kudroli Gokarnath Temple is situated 3 km away from main city area. Recently, this temple has been renovated and now it is one of the tourist attraction places in Mangalore. Nearest Railway Station:The Mangalore train station is on the southern fringe of the city center. However, some of the trains stop at the Kankanadi Station situated 5 km east of the Mangalore main city. Nearest Airport: Mangalore city is accessible by almost all the transportation systems. The airport is 20 km from the city center. One can take the locally available road transport medium to reach the airport to catch a flight. Road Transport:The state transport system is well maintained in the city, which connects it with the nearby places of importance. Numbers of auto-rickshaws are also available in the main city area. There are a number of hotels and lodges are available in the Mangalore city. One can easily opt for the different ranges available here. These hotels also provide good delicacies to indulge on. We offer excellent accommodation facilities in and around Mangalore. * Vimlesh International Ganapathi Temple Road, Mangalore Phone: +91-824-33711(10 lines). Dussehra and Sri Krishna Janmashtami are two of the festivals that are celebrated with notable festivity and enthusiasm. Sri Krishna Janmashtami witnesses the exuberant enactment of the God's childhood endeavors to steal butter and curd from earthen pots beyond his reach. A matka or pot containing these is suspended high above the ground and groups of young men and children form human pyramids to try and reach the pot and eventually break it. Tiger Dance is a unique form of folk dance in Dakshina Kannada that fascinates the young and the old alike. Since tiger is considered as the favored carrier of Goddess Sharada (the deity in whose honor Dussehra is celebrated), this dance is performed during the Dussehra celebration. It is also performed during other festivals like Krishna Janmashtami. Aati festival is also one of the festivals especially celebrated in Mangalore. Aatikalanja is a ritualistic folk dance performed by the Nalke community. Kalanja is the name of a minor spirit who is in charge of the protection of the village folk during the month of July-August rainy season. And that was Aati (Tulu for the month of Aashadha), wherein, according to the Hindu almanac, nature was at her vicious best. Aati commences from July 17 and runs up to August 15. Along with the other Hindu festivals, Ganesh Puja and Navaratri are also celebrated here. The Name KATEEL: The word 'Kati' which means 'center' (between the 'Kanakagiri', birthplace of river Nandini and the end) and 'lla' which means 'area'. Thus the place is called 'Kati + lla' = Kateel.